Our 6 door lockers from Elite features a white body and a white door making it the ideal choice for medical environments for use by doctors and nurses in hospitals and surgeries - or anywhere that a clean white décor is preferred eg. gyms, offices, sports clubs, etc. Our six door locker from Elite provides 6 compartments with secure and ample storage for handbags, coats etc. Manufactured in the UK to the highest specification. 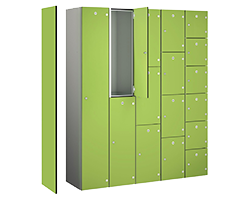 This locker is also available in a variety of other colours. Seat stands are available in matching white or in a beech wood effect. When these stands are used, lockers are raised by 340mm and the seat height is 370mm. The stands are constructed from welded 38mm tubular steel, powder coated to match locker carcass. The stands have adjustable feet. These stands offer the user somewhere to sit when they are getting changed / putting their shoes on. Locker stands without seats are also available - these raise the locker by 150mm and help to keep a clean floor.